Just in case you pigged out on the 4th of July and are feeling bloated, guilty–dare I say it–you’re feeling fat (oh no, I didn’t! ), then here is an amazingly sweet, delish dish (healthy, too!) that I serve for breakfast or lunch–sometimes, as dessert–that is likely to get you back on track, on the proverbial weight loss wagon and help you to lose weight! 1 Tablespoon Fruit Juice, freshly squeezed OJ works well! With your wits about you, and sharp knife in hand, slice open the peach and remove the pit. 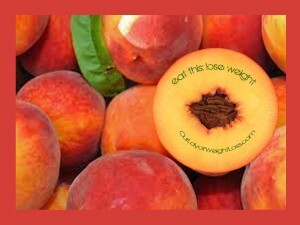 Slice peach into thin slices or cube it, whatever you like! …Divide the peach slices into two tall glasses or short ones, just make them there glasses aesthetically pleasing. Save a few slices to top your creation! Sprinkle the granola on top of the peaches. Again, warning!!! Granola or any crunchy cereal will do, and calories here are deceiving! Still, you want to put enough in the mix to create that oh-so satisfying crunch! Stir the jam and that one tablespoon of oh-so important juice together. Drizzle over yogurt. Artistically, with flair, to music maybe, place remaining “decorative” peach slices on top! …this sweetly satisfying peach parfait! For more dishes that stir the imagination, join Our Lady of Weight Loss‘s Club: Facebook/A Kick in the Tush Club!